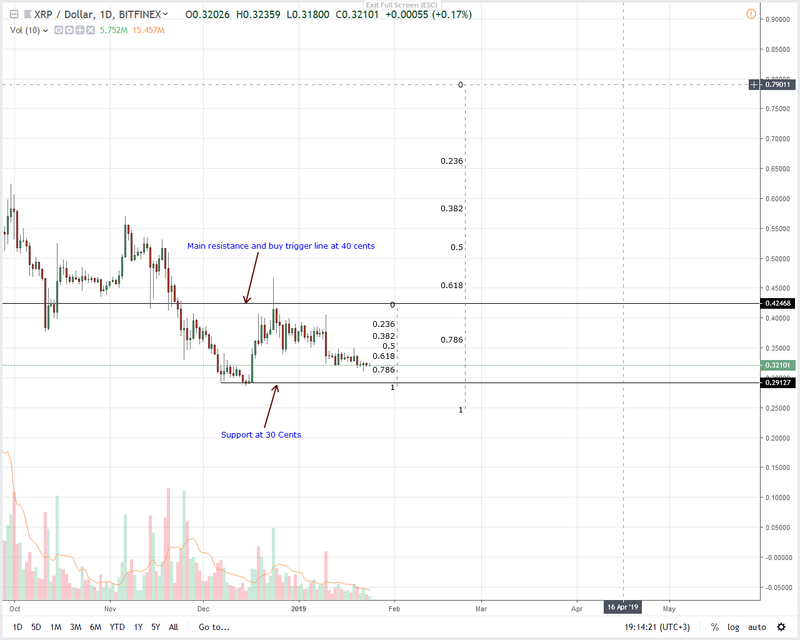 Fundamentals and technical candlestick arrangements support XRP. However, for a bull trigger, XRP prices must rally past 34 cents at the back of high transactional volumes. Catalyzing this demand should be positive fundamentals. Brad Garlinghouse is right. A blockchain platform valuation is directly proportional to its demand or usefulness. It’s a reiterated adage that rings true regardless of the project’s ambition. To this end, Ripple is striving to draw value. And they have been pretty successful. As a network that caters for the needs of global banks, their system is secure and above all efficient. Ripple’s speed and efficiency give it an advantage over other platforms. Meanwhile, XRP is stable and down 3.8 percent against the USD in the last week. Since prices are ranging—like other assets, and trending above the all-important support at 30 cents, traders should interpret it as bullish. As laid out yesterday, risk-off traders should wait for a complete break and close above the 50 percent Fibonacci retracement level of Dec 2018 high low at 34 cents. Accompanying this breakout should be above average volumes forming the foundation for further expansions. After that, we’ll have a three-bar bull reversal pattern solidifying our bullish conviction with modest targets at 60 cents. While we are net bullish, accompanying volumes confirms why prices are ranging within a 2 cents zone. From the charts, volumes are low—averaging 17 million which is nothing when we compare with those of Jan 10—83 million when averages were 30 million. Ideally, gains above 34 cents should be supported by volume exceeding 17 million and even 30 million—above those of Jan 14.